Rich Turner is no fan of globalization. But he also benefits from it. As a senior manager of one of America's last denim manufacturing plants, Turner has had to cut his workforce by more than half in the past decade as competition from abroad ate into his profits. So is Turner excited by the idea of a "President Trump" tearing up NAFTA? Not at all: The free trade agreement with Mexico and Canada is key to his company's survival — and for the 2,700 workers at the plant in Mauldin, S.C.
Turner exports 85% of his denim duty-free to Mexico to be cut and sewn into jeans, which are then shipped back to the United States to be sold. "Without NAFTA, we would be out of business," says Turner. In addition to scrapping NAFTA, Trump has threatened a 35% tariff on cars and air conditioners coming from Mexico, with the promise of bringing jobs back to America. Turner supports Trump and imposing tariffs on China. But he worries about that tactic with Mexico. A tariff would make jeans imported from Mexico more expensive. He worries Mexican plants there would order less of his denim as a result. And the situation could get worse. If Mexico were to retaliate with tariffs of its own, then Turner's denim would become much more expensive for his Mexican clients. "If ... both Mexico and the U.S. (put) tariffs on each others products I don't see how that's a win," says Turner. Overall, the denim textile business has been hit hard since NAFTA became law in 1994. That year, there were nearly 500,000 workers at textile mills in America. Today there are only 113,000, according to the U.S. Labor Department. By 2000, there were about 15 denim mills in America. Now there's only 3 left. Monte Galbraith owns one of them. His denim plant has shrunk over the years too. Like Turner, he too ships the majority of his denim to Mexico. He has about 250 employees at Denim North America located in Columbus, Georgia. That's down from 350 employees about 15 years ago. "When NAFTA kicked in, it pulled the plug on our industry," says Galbraith. "I applaud [Trump] for bringing [trade] up, but I don't think his response is the right one as far as slapping on tariffs." Galbraith believes a Trump tariff is unlikely to happen. 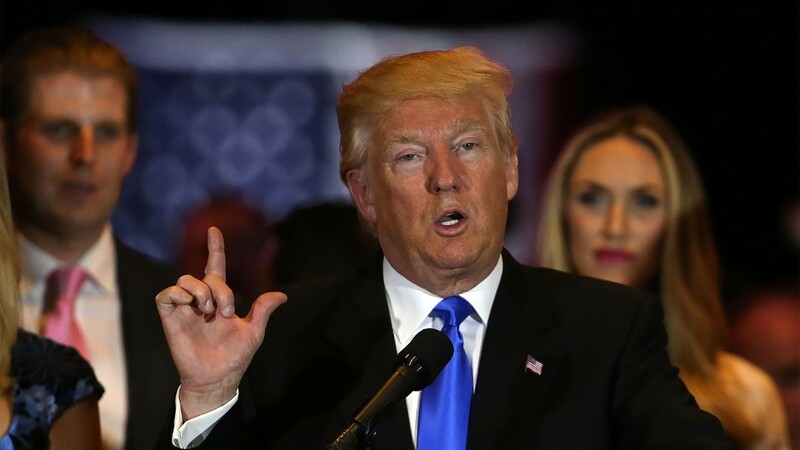 He doesn't see much point in renegotiating NAFTA but he thinks the U.S. should renegotiate the latest trade deal Trans-Pacific Partnership, or TPP, based on the fact that NAFTA hasn't been a good deal in his view. Turner and Galbraith both admit their businesses rely heavily on Mexico. And they're not alone. About 6 million American jobs depend on trade with Mexico, according to the U.S. Chamber of Commerce. In Georgia and South Carolina alone, 272,000 jobs rely on trade with Mexico and almost all the denim made in Georgia goes across the border. According to the Congressional Research Service, 40% of the parts in Mexican exports actually originate in the United States -- just like the denim Turner and Galbraith ship to Mexico. It would also hit the American shopper, who would have to pay a lot more for the same jeans. "There's no doubt that such a large tariff on Mexican imports would destroy jobs in the United States," says Christopher Wilson, deputy director at the Mexico Institute, a Washington think tank. Peter Navarro, an economic adviser to Trump, argues that a tariff wouldn't hurt jobs, saying it wouldn't be a long-term solution but a means to get Mexico to renegotiate trade deals. "The tariff is not an end game, it's a strategy -- a strategy to renegotiate trade deals," says Navarro. 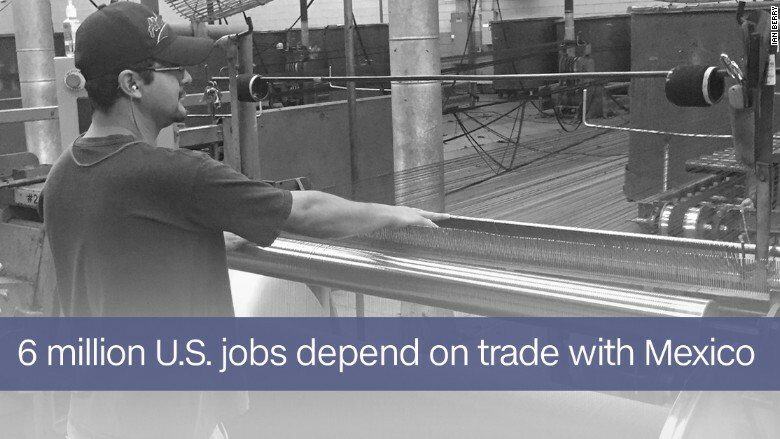 "Tariffs wouldn't put U.S. jobs at risk." However, workers who have already lost their manufacturing jobs, want to see some kind of retaliation. And tariffs seem like a good one, even though experts know that such a move will hurt everyone. After all, Americans overall benefit from cheaper prices for goods. But Americans take that as a given -- few spenders celebrate that when they go shopping. Still, some say pointing the finger at Mexico isn't the right answer given how many jobs depend on trade with it. "I'm from the Midwest, I get that people are hurting," says Eric Farnsworth, a trade expert at the Council of the Americas. "It's a mistake to put this on NAFTA...[a tariff] would be horrible for jobs on both sides of the border."